Harvested all 5 purple kohlrabi from the window box (click on link and scroll down). Could have waited a few more days to harvest but I needed the window box to sow my spinach seeds. All the items below except the fig, are first of the season harvest. I harvest one fig in early June. This was unusually early and I was totally taken by surprise. Popped it in my mouth to see what it tasted like (it was sweet as honey) so of course there is no photo and I neglected to note the date so no accurate record, bummer. No sign of another ripe fig until yesterday. This one was sweet also. Many starting to turn brown so more will be coming in soon. Was going to discard the lower portion of the broccoli stems, but decided to peel them and discovered the whole stem was tender. Chinese long beans are also known as yardlong beans, asparagus beans, noodles and snake beans. The red noodles should be ready in a day or 2. To learn more and recipe click here. Love the flavor of the Black Pearl Cherry Tomato, this is a keeper. Lost the first few as I thought it would be black and was waiting for it to get darker. Dave, Our Happy Acres, sent me the seeds last year. You would enjoy perusing Dave’s blog, he is not only a gardener he also does all sorts of other neat things, I will let you go find out for yourself. Got the blue potato and Tohya soy beans from Mary, Mary’s Veggie Garden. Do check out her blog. She is an organized gardener and a planner. Keeps meticulous records. Hoping some of her skills and discipline will rob off on me. About 2½ years ago I bought different blue and red potatoes from the Rhinebeck’s Winter Farmers Market for planting and made sure I saved some of the year’s harvest for planting the following year. Last year I ate them all (forgot to save). Had no seed potatoes to plant this year. But Mary came to the rescue and gave me 2 blues and 1 red. Wondered if they are from the ones I shared with her previously? My black soy beans should be ready need to find time this week to harvest. Both the Tohya and black soy beans are harvested while the pods are still at the green stage and known as green soy beans and edamame. To learn more about green soy beans/edamame click here and here. The tohya soy beans went into a ground pork dish. Unfortunately I forgot to take note and have no recipe to share. This is what I did: Parboiled the soy beans for about 5 minutes (to make shelling easy). Sautéed lean coarse ground pork (I make my own ground pork) with garlic, chopped onion and grated ginger. Seasoned with dark soy sauce, salt, pepper and honey. Add broth and soy beans and simmered for 15 minutes, stirred in 1½ tablespoons red miso, thickened with cornstarch and water mixture and served over rice. 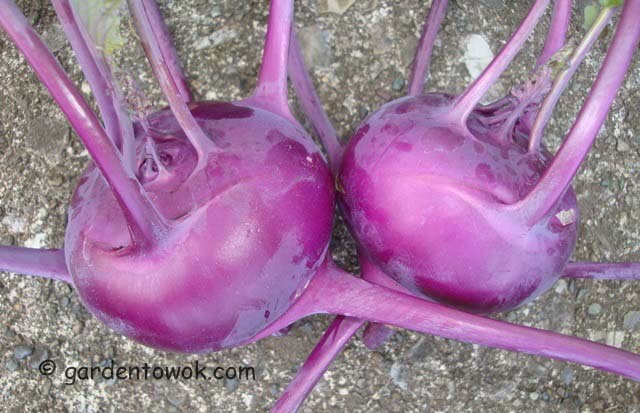 After peeling, the purple kohlrabi is the same color as the green one but they look pretty in the garden that’s why I plant both. 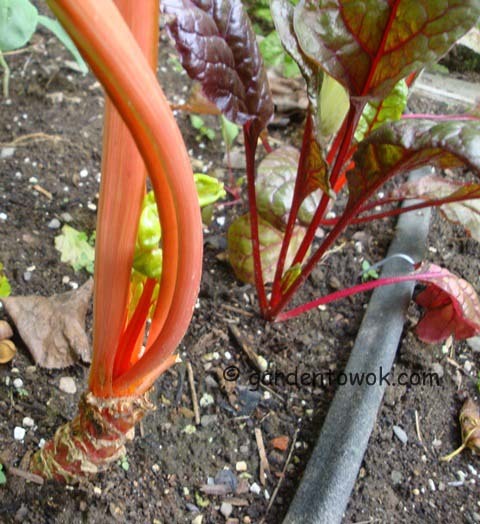 The Swiss chard on the left is getting leggy and will get leggier as the season progresses and I continue to harvest the outer leaves. Before long I will need to stake the plant to prevent it from toppling over. As you can see from the photo it is already leaning. All my Swiss chards in the garden are doing exceptionally well this year so decided to do an experiment with some of the plants. The seedlings I started some weeks ago needed to be transplanted, but instead of putting them in a newly prepared bed, decided to interplant them between a portion of the spring planted chards. Now that the seedlings are established I will pull the spring planted chards to give the new seedlings room to grow. Will continue to harvest from the other spring planted chards until the new seedlings mature. Once the fall seedlings reach harvesting stage, I will pull the remaining spring planted chards and transplant my beet seedlings. Not sure if there is sufficient time for the beets to form but I can always use the beet greens. Did the same interplanting with my collard and kale. By doing the above I am able to get more mileage out of the same amount of garden space, will need to do some tweaking with the timing for starting the fall seeds. The week’s harvest included more chards, tomatoes, Ping Tung eggplant, Chinese chives, okra and lettuce. Made a veggie medley stir-fry with the broccoli, long beans, onion and one of the kohlrabi. Should have stopped there but last minute decided to added a Ping Tung eggplant as well and that was a mistake, did not like the result, I learnt. … … … … … … … … … … … … … … … … … … … … … … … … … … Copyright © by Norma Chang. All Rights Reserved. Do not use/repost any photos and/or articles without permission. 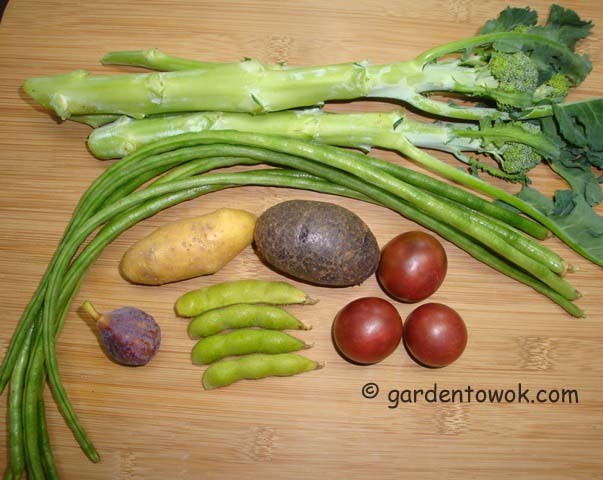 This entry was posted in Gardening, Harvest Monday, Recipes, Vegetables and tagged asparagus beans, black pearl cherry tomato, blue potato, broccoli, Chinese long beans, edamame, fig, green soy beans, purple kohlrabi, soy beans, tohya soy beans. Bookmark the permalink. I harvest my broccoli with long stems and peel them too. I might like the stems more than the buds. Lovely harvests. Thanks. I too like the stems better. sure glad I did not throw them out. Your purple kohlrabi looks stunning.I did plant some white variety but it never germinated, I think my seeds may have been to old. Hopefully next year. Your seeds may have germinated but some critters had the seedlings for breakfast. I find starting the seeds in cell pack to be more successful than in the garden. Love these purple kohlrabi and potatoes! Can’t help..the colour is just gorgeous. I agree the purple kohlrabi is gorgeous, purple is my favorite color. I’m glad you are enjoying the Black Cherry tomatoes. They are a favorite here too. I love those purple kohlrabi. They sure seems to do well in containers. I gave one of the Black Cherry tomatoes plants to my daughter and she and her husband love them. I am having good luck with all my containers this year. Yes indeed, the Red Thumb and the blue potatoes are descendants of stock you shared with me a few years ago. I recently heard of an all blue potato that is much bigger than a fingerling. I need to keep an eye open for it. I am going to visit the Rhinebeck winter market again and will look for the (big fingerling) all blue potato then, will get some for you if I find them. I did see them at Adams, WF but not sure if they were treated with growth retardant or not so did not buy. 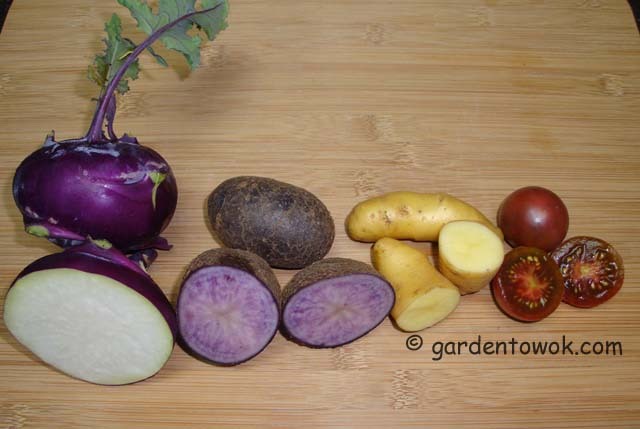 What a fantastic variety, and such lovely colors in kohlrabi and cross-section picture. Thanks, I like to know what the inside of those crops look like and imagine others do too. Beautiful harvests! I miss broccoli – – had to pull my plants in June because they didn’t care for our extreme heat. This reminds me that I need to dig up some potatoes! Thanks. Crazy weather this year, we are having a cool August, I love it so do the cool weather crops but the heat loving plants do not. Such beautiful colours in your harvests! Those edamame with the pork look so tasty. I was hoping to grow some soybeans for edamame this year but I couldn’t find the room. Hopefully next year! Thanks, the dish was very tasty. Hopefully you will be able to make room for edamame next year. Love the color of that purple kohlrabi. Never cooked with it, somehow and not sure I’ve even tasted it. Must remedy that! Your pork dish looks delicious. Have a great week! Isn’t that a gorgeous purple? Purple is my favorite color. It taste the same as the green variety. Well actually I should do a side by comparison to be sure. A great week to you too. I love figs. We haven’t had any all summer. I think we need a trip to the farmer’s market this weekend! Hope you find lots and lots of figs at the farmer’s market. Do you have a favorite variety? I would love to grow a California black fig and a green fig, unfortunately there is room for only one fig tree to over winter in my garage. I’m always so impressed with your beautiful bounty! I’ll have to visit the blogs you mention. Thanks! Your veggies look so healthy and wonderful Norma, and the date looks amazing! Thanks, it is a fig, wish I could grow date in my area. Double scoops of soy beans and meat over rice for me please! Ready and waiting. Did you plant the black soy beans this year? I love all your veggies but this time I am jealous of figs. I’d love to have it in my garden. Fig is very easy to grow. It is a bit of a hassle for me due to our cold winter. I have to grow the fig tree in a container, wheel it into the garage for winter storage and wheel it out in the spring but it is worth the effort. Thanks. It does contain lots of deliciousness. The purple kohlrabi is incandescent. White/green is so boring. The pork/edamame dish looks fantastic. When we have soybeans, we usually just cook them for a few minutes, drain and toss with soy sauce and eat as a snack. Nice way to turn them into a main dish. Isn’t that a gorgeous purple? I do the edamame snack also but prefer to make main dishes. 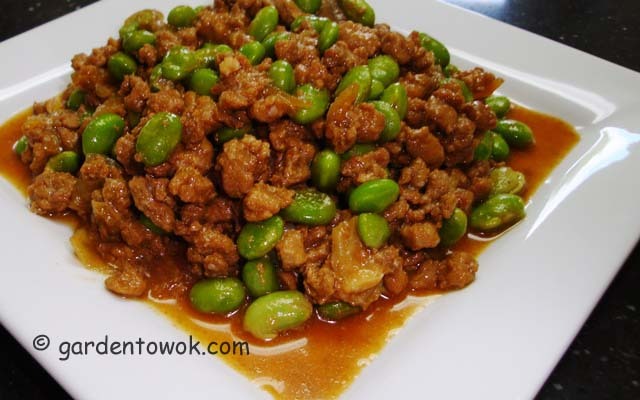 Hello Norma, the pork dish looks so delicious with soy bean. It is a bit like za-jiang-mian. Isn’t it? We also got two figs ripen the other day from two different trees. We hope for more to ripe later on in the season. Yes, the dish is an adaptation of za-jiang-mian. Glad you are enjoying tree ripened figs from your trees. Were they 2 different varieties? Yes, the figs were from two different trees – one was called Chicago Hardy and the other one was Lattarulla (aka Italian Honey). The Lattarulla stayed green even when it was ripe. I would love to grow a green and a black variety but no room in the garage to overwinter them. I’m so glad you shared that recipe.. it’s tantalizing me and it’s already well past my dinner time:) I can’t believe you grow your own figs.. we can’t even get them in the grocery store here.. I’m living vicariously!! I have to grow my fig tree in a tub. Wheel it into the garage for winter storage and wheel it out in the spring. This may be doable in your climate as well. Eva of Kitchen Inspiration, is growing one successfully in Toronto. I will be happy to send you how to info if you want to give it a try. I am thoroughly enjoying my home grown produce. I am settling into my new kitchen very, very slowly. Getting used to the new layout, decisions on how to arrange/rearrange the cabinets and drawers, and remembering where I finally decide to store the numerous kitchen wares….. Eventually I get my act together. I am enjoying my new kitchen though it is taking me a bit of time to get used to the new layout. I have better results starting my kohlrabi in cell packs then transfer to the garden. My garden kohlrabi did not do as well as the ones in the window box. Wow, I love all the colors of your veggies…especially the purple Kohlrabi…I love the sound and the look of your soy and ground pork…delicious! The dish was delicious. Had some leftover and tossed it with sweet potato noodles and was equally as good. A wonderful week to you. Great yield from the garden Norma, I bet you enjoyed that stir fry pork with soy beans even more so in your shiny new kitchen. I love the little area with the stools, the perfect place to park yourself and nurse a glass of wine while watching you cook! JT sits at our island while I cook and it’s so nice (unless I’m trying to concentrate, then it’s not so good). My dear Mom used to make Kohlrabi but to be honest, as kids we never enjoyed it. I should definitely try it again. We also grind our own meats, which part of the pig do you use for lean ground pork? Thanks. Yes, I am enjoying my new kitchen and yes, I am sitting on that stool a lot, glad I designed that little corner. Do give kohlrabi another chance I like to stir-fry until al dente, it is crunchy and delicately sweet. I use pork sirloin cutlets. I love kohlrabi!!!! I’d never even heard of it until I was in culinary school. Yours are huge! And I’m so glad you saved the broccoli stem, I think it’s the best part if it’s tender. So so good. Kohlrabi is very easy to grow, the taste and texture of home grown is so much better than the store bought unless it is from the local farmer’s market. I always peel away the outer layer of my broccoli stems this makes them tender.